When I was in college for teaching we had to start our own library "card catalog" of books we would use in our classroom. Unfortunately this didn't really apply to me since I never planned to have an elementary classroom and read picture books. But I spent one Saturday at the library anyway (and got my wallet stolen - but that's a story for another day) looking at all the Caldecott winners. 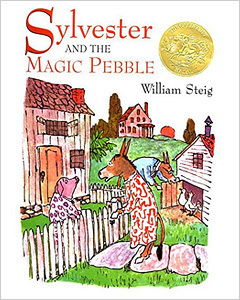 First is the story of Sylvester and the Magic Pebble by William Steig. This was the 1970 winner and a book I remember from my childhood. I was surprised to see it on the list - I suppose because I just never thought about it. It's a fun story about a donkey with a magic pebble who goes for a walk and is accosted by a lion. He wishes he was a rock so that the lion won't eat him... and because he's holding the pebble, his wish is granted! I guess you'll have to go check it out from the library to see how it ends! My second pick is the book called Tuesday by David Wiesner. It was the 1992 winner. I don't remember where I first ran across this one, I think it might have been on a date with Brian to Powell's bookstore in Portland. We ended up in the children's section finding really fun books and reading them to each other. Anyway, this is an almost wordless book about what happens on Tuesday evening. Frogs start flying... The pictures are amazing and the idea is so fantastical that it's a really fun story! He has another story called June 29, 1999 that is equally fun and it looks like many of his other works (found here) would be interesting! And of course this list wouldn't be complete without mentioning that one of the most well known (and loved) is the 1964 winner - Where the Wild Things Are by Maurice Sendak. I reviewed The Hello, Goodbye Window with some help from my four-year-old son. I haven't heard of them either! They both sound good, and I'm particularly intrigued by the second one. Thanks! Yes! HA! I DO thinkwe've had the OR conversation before. I thought as much and was afraid to say it all again on your blog. ;D funny. I've really enjoyed this carnival because so many reviews have been of books that I have never read before. I have read Sylvester, but Tuesday was a new one for me. Thanks for the great reviews!